The online version of this article (doi: 10.1186/1471-2164-15-1081) contains supplementary material, which is available to authorized users. Pathogen populations, particularly species with mixed sexual and asexual reproduction systems like E. necator, rapidly evolve to circumvent host resistance genes or to counteract chemical control methods . Though new fungicides are being developed and breeding for genetic resistance is ongoing, little is known regarding how E. necator evolves to become resistant to fungicides or how it overcomes host immune responses. 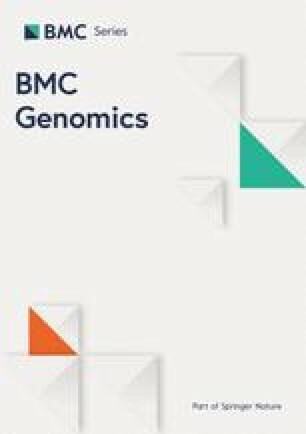 Whole-genome sequencing, transcriptomics, and comparative genomic approaches have been successfully applied to other fungal plant pathogens . However, publicly available genomic information for E. necator is scarce and limited to SSR markers [24, 25, 26], likely reflecting the difficulty of working with an obligate parasite. Genomic analyses of related powdery mildew species (Figure 1D), including the ascomycetes that cause powdery mildew in barley (Bgh; [27, 28]) and wheat (B. graminis f.sp. tritici; Bgt, henceforth; ) have provided insights into their evolution and mechanisms of pathogenicity. To enhance gene discovery and gene structure prediction, we sequenced and assembled the E. necator transcripts expressed during the interaction with grape leaves at 0.5, 1, 3, and 6 days after conidia inoculation (Additional file 7: Table S4; Additional file 8: Figure S3A&B). Assembled transcripts were then used as evidence in a gene prediction pipeline that combined evidence-based, homology-based, and ab initio methods (Additional file 8: Figure S3C). 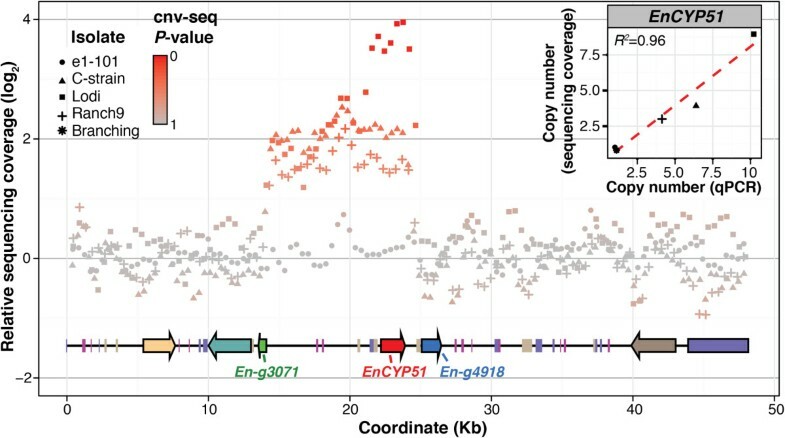 After removing 4,511 genes associated with TEs, we estimated that the E. necator genome contains 6,533 protein-coding genes. A similar total number of protein-coding genes was identified in Bgh (6,470 ; Additional file 9: Table S5) and Bgt (6,525 ). Nearly 92% of the predicted genes have detectable similarity to proteins known from other ascomycetes (BLASTP e-value < 10−3; NCBI Ascomycete nr; Additional file 9: Table S5; Additional file 10: Table S6; Additional file 11: Figure S4). Percent BLASTP matches and alignment coverage between the peptides of E. necator and other fungi, support the overall quality of the gene prediction pipeline results (Additional file 12: Table S7). 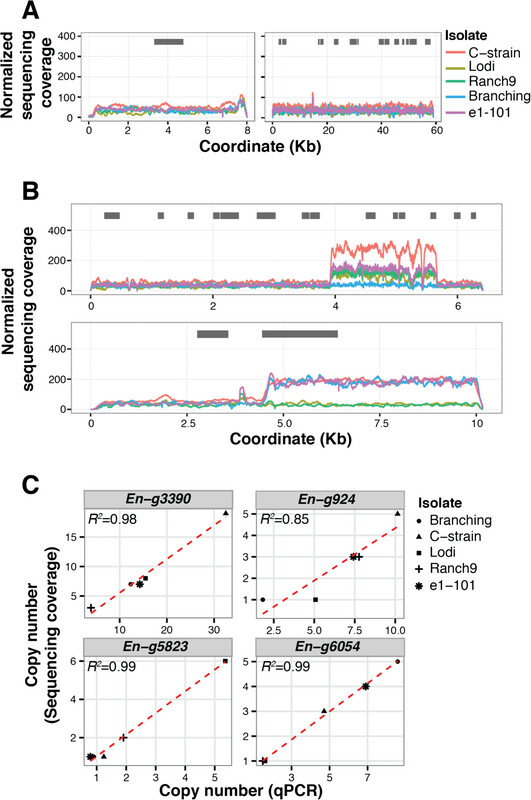 Prediction accuracy was also supported by the identification of higher frequencies in nucleotide variants in the intergenic space (0.89 ± 0.01 SNPs/kb) and intronic regions (0.57 ± 0.07 SNPs/kb) than in the exons (0.35 ± 0.04 SNPs/kb; Additional file 5: Table S3). An average of 1.7 introns per gene were predicted and, similarly to observations in other fungal genomes , intron lengths had a narrow distribution with mean size of 83.7 bp (exon mean size = 526.5 bp; Additional file 8: Figure S3D-F). Genes on longer scaffolds displayed shorter intergenic spaces than those on smaller scaffolds, suggestive of an uneven distribution of genes within the genome (Additional file 8: Figure S3G). As reported in previous analyses of powdery mildews [27, 28] and other obligate biotrophs [33, 34, 35], the E. necator genome showed a loss of enzymes involved in secondary metabolism, nitrate and sulfate metabolism, further supporting the convergent adaptation of obligate biotrophy (Additional file 3: Text S1 ). We did not find any of the genes known to be required for Repeat Induced Point mutation (RIP) suggesting that the mechanisms that usually control TEs in fungi are only partially functional in E. necator, as previously observed in other powdery mildew pathogens (Additional file 3: Text S1; ). 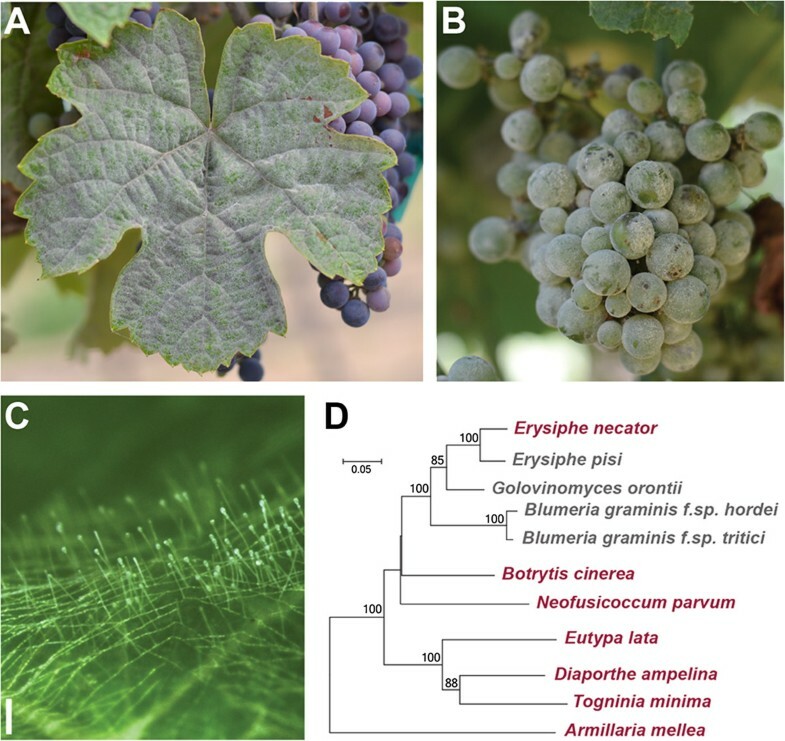 This study describes for the first time the genome of one of the most widespread and devastating diseases of grapevines. With an estimated size of ~125 Mb, the E. necator genome is among the largest sequenced ascomycete genomes. The E. necator genome also possessed a characteristic reduction in protein-coding genes, a feature also seen in the genomes of other biotrophic fungi . The expansion of genome size in powdery mildews [27, 28, 29], including E. necator, is associated with the proliferation of repetitive DNA, particularly TEs, which account for about 63% of the E. necator genome. TEs were also detected in the E. necator transcriptome, indicating that they are transcriptionally active at least during host infection. Active TEs are a major source of mutations in the genome. Transposition of TEs not only contributes to the expansion of genome size , but can also cause chromosome breaks and rearrangements , gene deletions , gene duplications , illegitimate recombination , and changes in gene expression [56, 57]. TE activity has also been associated with the evolution of pathogen virulence factors . While the Y136F mutation reduces the affinity between CYP51 and the inhibitor [12, 21], sensitivity to DMIs has also been shown to depend on the expression levels of CYP51. In other plant pathogens the overexpression of CYP51 has resulted in decreased susceptibility to DMIs [15, 67, 68, 69]. 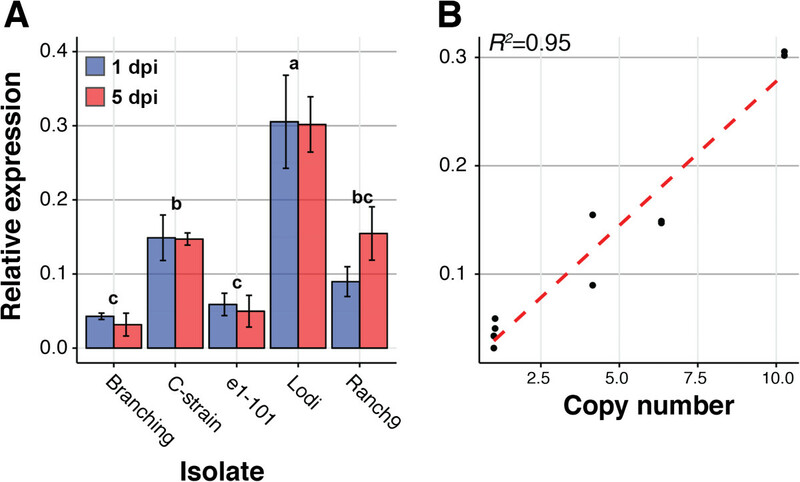 Segmental duplication of a 126-bp fraction of the CYP51 promoter led to increased expression of CYP51 in a fungicide resistant strain of Penicillium digitatum, while duplication of the entire chromosome bearing the CYP51 gene resulted in increased fungicide resistance in the yeast Candida glabrata. Although polymorphisms have been found in resistant CYP51 genes [71, 72], no clear association between a specific mutation and an increase in CYP51 expression has been reported in fungi.